hese days the previews are usually better than their own movie. 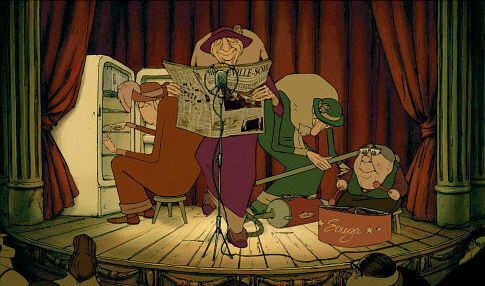 But that's not true of The Triplets of Belleville, where the amazing previews never stand a chance. ... but here goes: A tough, driven grandma discovers her seemingly disengaged grandson harboring a hidden passion for bicycles. Grandma whips the nebbish lad into world-class shape before the underworld kidnaps him during the Tour de France. He's shuttled across the sea and forced into slave labor  something to do with an elaborate gambling game in a Gotham-like city where most everyone is morbidly obese. To rescue her grandson, grandma happens upon the help of three aging former cabaret stars who were wildly popular in the 1930s but have become increasingly reclusive and incredibly eccentric. Grandma in training mode with daydreaming dog. Meanwhile, grandma discovers her own latent music-making talents and nudges the trio back into the biz with her uncanny knack for percussion. There's also a faithful, overweight dog whose every thought involves food, and then there's a suitably odd but reasonably happy ending. Along the way is a seamless array of Dali-esque images and vistas. Incredibly, the 91-minute movie tells its story with nearly no dialog. Instead, the wall-to-wall soundtrack, which approaches perfection, is timeless, tasty and totally debonair. 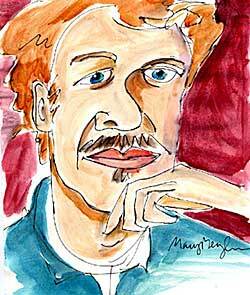 The jazzy songs work as a series of inventive, challenging compositions, or as jaunty, quirky, background fare. The music befits the story and gems are sprinkled throughout. There's a simple, piano-based beauty, "Bach A La Jazz." There's "Cabaret Aspirateur," which moviegoers will recall as linked to a vacuum cleaner, a refrigerator shelf, the crinkling of newspaper and grandma playing her bicycle spokes. There's an Elvis Presley-style number with a bawdy sax and a secret-agent sound that gets crooned in French. And then there's the triplets' giddily nonsensical theme song. There isn't a dead spot on the album and one thing's for sure: things start to cook whenever those swinging sisters come around. 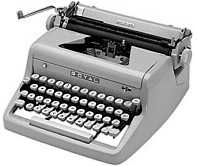 But it's the sum of the parts  images and music  that creates the powerful package. The only comparison that comes easily to mind is from the mid-1960s: Cinerama, the three-camera, three-projector, wrap-the-screen-halfway-round-the-theater filmmaking medium that was briefly en vogue before being deemed too expensive to make. Grown-up grandson at grandma's training table with well-fed dog. In '68, Stanley Kubrick's 70mm print of 2001: A Space Odyssey was shown on the massive, curved Cinerama screen in Minneapolis  truly a mind-bending experience. I still recall a curious 10-year-old self, overhearing the random conversations made by dumbfounded adults as we all staggered toward the parking lot, stunned. Even dad was at a loss to explain. I also remember the experience as life-turning, as it so sure-handedly suggested not only the infinite nature of outer space, but also the infinite potential for humankind to create boundary-blasting art. It was all truly of another world. The Triplets of Belleville lives up to its amazing previews, then blows them away. 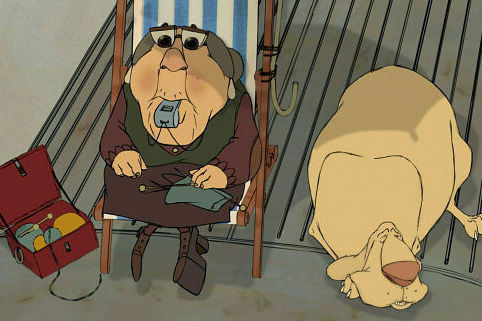 But where 2001 projected brave new cinematic and intellectual concepts of outer space, The Triplets of Belleville turns the trick regarding the real final frontier  the inner space of the mind. Me? I got hooked upon seeing the Belleville previews before a December screening of Wings of Desire at Portland's Cinema 21. 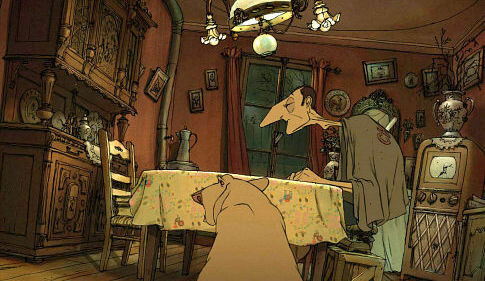 Half-expecting disappointment, I just had to see Chomets movie. The fully formed film lived up to its previews, then blew them away. 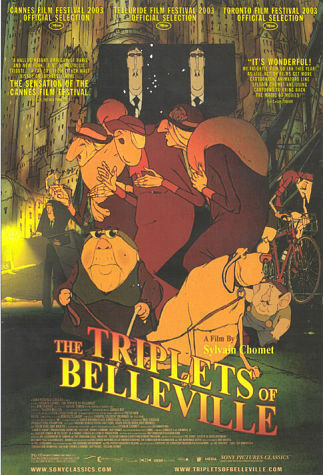 Sure, The Triplets of Belleville will be around forever on CD and DVD. In that sense, there's really no reason to rush out and see it. Then again, it might be wise to catch it now for the sake of the big screen. Because the sooner we do, the sooner some of us will need to see it again. And somewhere down the line some ardent auteur will be inspired to delve even deeper.